"We are the Resistance now." Star Wars Resistance is an animated series set in the Star Wars universe and created by Dave Filoni, the Lucasfilm animation veteran behind The Clone Wars and Rebels. It is executive-produced by returning Star Wars animation alumni Athena Portillo and Justin Ridge, as well as newcomer Brandon Auman (Teenage Mutant Ninja Turtles, Iron Man: Armored Adventures). Taking place six months prior to the events of The Force Awakens, Resistance depicts the story of young Resistance pilot Kazuda Xiono (Christopher Sean), who is given a top-secret mission by Poe Dameron and General Organa to spy on the First Order at the Outer Rim fuelling station Colossus. Working undercover as a mechanic, Poe stations him with an old friend of his, a veteran pilot named Jarek Yeager (Scott Lawrence), who runs a starship repair shop on the Colossus with his crewmembers Tamara "Tam" Ryvora (Suzie McGrath), Neeku Vozo (Josh Brener), and Bucket. Along the way, Kazuda befriends starfighter racer Torra Doza (Myrna Velasco), and accompanied by BB-8, he keeps his true mission a secret from his newfound friends  after all, you never know who's a friend in the Outer Rim. BB-8, Poe Dameron (Oscar Isaac), and Captain Phasma (Gwendoline Christie) all appear. C-3PO (Anthony Daniels) makes a voice-only cameo in the first episode. It premiered on Disney Channel in Fall 2018, then moved to Disney XD. In January 2019, it was renewed for a second season, which is set to premiere in Fall 2019. All character tropes should go on the Character page. 0% Approval Rating: Unsurprisingly, no one in the Colossus likes the First Order anytime they come to visit. But no one does anything about it because the First Order is allowed to come there like anyone else and they're not perceived as being any worse than groups like the Guavian Death Gang. However, disdain for them sets in full force among most residents after they occupy the platform and begin to curtail freedoms. Adaptational Attractiveness: Neeku 's design is much softer and cuter than most examples of the reptilian Kadas'sa'Nikto race. Adventure Town: The series is set on the Colossus, an old refueling platform on the Outer Rim ocean world of Castilon, a haven for smugglers, fighter pilots, and criminals that's now of interest to both the Resistance and the First Order. Evident throughout Kazuda's character arc; you can try your hardest and put all of your heart and determination into something and still come up short, but failure isn't always permanent and it's not worth beating yourself over. Rather, the best thing to do when you fall is to just get back up again. Don't put up with terrible people under the belief that everyone should be treated fairly. If you let them be assholes, then they're gonna take that opportunity and run with it, which will eventually culminate in them doing awful things, and when that happens, it'll be too late to stop them. Early on in the show, the people on the Colossus do nothing about the First Order's presence on their station because they think that they have an equal right to go there and that they're ultimately harmless, and we know that this kind of inaction in dealing with the First Order is what allows it to grow into the force it is in the Sequel Trilogy. Being the best at something can earn you fame and glory and money, sure, but get too arrogant and there will be a price to pay, including alienating the people you care about. However, the same episode also gives us the lesson that it's important to forgive those who have wronged you, especially when they're trying to make up for it. You don't have to forgive them immediately, but at least open yourself up to their attempts. Agony of the Feet: BB-8 has a distinct tendency to roll over Kaz's feet. All-CGI Cartoon: Like the previous Star Wars animated series, the show uses CG animation. Unlike them it uses cel-shading, making it look significantly different. The Alleged Car: The Fireball, the ship Kaz is loaned to race in, is old and has a distinct tendency to malfunction and fall apart while it's being flown. It seems Resistance mechanics were able to fix most of the ship with Tam none the wiser. Animesque: It has been described as being anime-like, as evidenced by the show's cel-shaded art style, character design, and the more over-the-top expressive way the characters are animated when compared to the more realistic The Clone Wars and Rebels. It tends towards a Studio Ghibli style more than mainstream anime, though, with many settings and characters that would look right at home in one of their films. Apathetic Citizens: Many residents of the Colossus are blind to the dangers of the First Order, even after they take over the platform and begin taking away people's rights. Tam, one of the main characters, has a particularly bad case of this. Artificial Gravity: The Season 2 premiere takes place almost entirely in zero-G as Kaz, Torra, Neeku and CB-23 try to repair the Colossus' broken gravity generators. Kaz and Poe enter one to find a freighter transmitting a distress signal in "Signal from Sector Six". Station Theta-Black is also located in one of these. Author Appeal: Filoni has said that he partially started working on the show due to his love of sky battles. Artistic License  Gun Safety: In "Signal from Sector Six", Poe, a trained soldier, fires his gun at the ceiling without checking to see what's up there (in an unfamiliar environment) to get the attention of some Kowakian monkey-lizards that are attacking Kazuda. A few seconds later, a dead one falls from the ceiling. Big Bad: Captain Phasma is initially the primary antagonist of the series, directing proxy forces, like Kragan Gorr's pirates, to act in the First Order's stead, so that she may station an occupational force on the Colossus. However, she departs halfway through the first season when the show crosses over with The Force Awakens, leaving Commander Pyre as the new Big Bad for the rest of the season. Theres quite a few jokes about racers dying by having their ship explode/crash or getting thrown off the Colossus if they back out of a race, in which either they die from falling headfirst or getting eaten by the various sea monsters that lurk in Castilon's waters. In "Bibo", Neeku is forced to give up his new pet after its mother wreaks destruction on the Colossus, and is clearly still depressed about it a few days later. To cheer him up, Kaz gifts him a new pet gorg. Neeku promptly eats it alive and then perks up, thanking Kaz for the delicious meal and saying that he's happier now. Bling of War: Commander Pyre is a First Order stormtrooper officer with gold-plated armor. Beneath Notice: The Chelidae act as maintenance workers and custodians for the station. They look slow and unassuming, but they are everywhere on the station and they know just about everything going on in the station. Call-Back: In Poe Dameron #26, Poe says that "[he] had to make a quick detour to pick up BB-8" right before he had to head for Jakku. Towards the end of Season 1, BB-8 returns to Poe's possession in time for this. Canon Immigrant: Oplock is a Mountain Nikto, one of the four Nikto species that originated in Legends. Cassandra Truth: Kaz's attempts to warn his co-workers about the threat of the First Order are initially dismissed, much to his frustration. Cerebus Syndrome: Starting in the second half of season 1, the show begins to get quite serious. Character as Himself: Bucket. Whether, like Chopper before him, he secretly has a voice actor is unknown. Cel Shading: A major part of the show's art style. Chrome Champion: In addition to Phasma and Vonreg, there's the golden stormtrooper Commander Pyre. Close on Title: Each episode's title is, like Rebels, only shown early in the credits. One of the banners in Aunt Z's Tavern is the symbol of the Protector of Concord Dawn. There's also a Mandalorian Protector helmet and an Imperial Supercommando helmet there on display. Torra's racer number is 5, which is decorated on her shoulder pads, similar to Sabine. Also, this is the fourth time the number 5 has been prominently associated with a character, the other times being with Fives, and Luke Skywalker/Red 5. Aunt Z has a space waffle tattoo. Space waffles were first seen in Rebels. Poe mentions the battles of Scarif and Jakku. Yeager also served at the Battle of Jakku. Yeager has some sort of connection regarding his family to Batuu, the setting of the Galaxy's Edge attraction. Thrawn: Alliances, released prior to Resistance, used Batuu as a setting, introducing it to canon for the first time as a tie-in to Galaxy's Edge. Torra has a poster of Sabine's starbird in her bedroom. Marcus gets in debt to the Guavian Death Gang because he destroyed one of their ships on Rishi. The plants in Captain Doza's office are shin'yah trees, flora native to Vardos. Their lore was explained in Inferno Squad. All of the Aces' various racers. The Fireball eventually qualifies by the end of season 1, once it's been fixed up enough. Cover Identity Anomaly: Kaz's cover is that he's a mechanic and aspiring pilot. So his distinct lack of mechanical skills is enough of a problem to make Tam suspicious. He's slowly picking up skill, though. Cowardly Lion: Kaz is almost always this when he gets involved in a fight or has to do something really dangerous. Despite being visibly terrified, he will still see the situation through to the end. Dark and Troubled Past: Yeager's wife and daughter were killed in a racing accident some years prior to the start of the show and he clearly misses them dearly. And just to rub salt into the wound, the racer responsible for the accident was Yeager's brother Marcus. Day of the Jackboot: From "The First Order Occupation" on, the FO presence becomes increasingly oppressive as they slowly take control of the Colossus in the name of "security". By "The Disappeared", they have started arresting and removing citizens who protest their authority, lock down the platform, and post pro-First Order propaganda in the public areas of the station. Doesn't Like Guns: Not explicitly stated, but a poster seen in the background at the entrance of the Colossus states that blasters are banned from the platform as a safety precaution. As a result, blasters are used a lot less in this show than previous entries. The only characters seen carrying blasters are Yeager (who was probably permitted), Poe (who isn't a permanent resident), the pirates, and the First Order (who actually made Captain Doza mad when they fired at Kaz, and he later requests them to follow his rules, in which they only shoot at Kaz and co. when it was clear they were enemies and they were in a space without civilians). This means that when threats like the pirates or the First Order come by, the cast usually are forced to run or be creative. Kaz is concerned that the Colossus is letting the First Order go there, despite being a cult that follows The Empire. Tam simply states that just like anyone else, theyre allowed to come here. Many people are uncomfortable with it, but ultimately assume that they're just harmless and that they should be treated fairly like everyone else. Kaz and Tam get into an argument about whether or not the First Order's growing presence on the Colossus is a good thing. Kaz argues that they're Obviously Evil because of their origins, as well as forcing them to stay on the platform and placing unreasonably strict rules on them, while Tam counters that the First Order is here to keep them safe and that they have to sacrifice some of their values for the greater good. Political discussions like these (besides the audience already knowing that the First Order is definitely evil) are not uncommon in real life. Dramatic Irony: Poe describes Station Theta-Black as the largest First Order facility he's ever heard of. An establishing shot of Starkiller Base is shown shortly after this. Engineered Heroics: The First Order ends their partnership with Kragan's pirate crew (and further cements their position on the Colossus) in this way, manipulating them into kidnapping Torra for triple the payment, but then rescuing her after she's captured and delivering her safely back home in order to gain Captain Doza's trust. Extremely Short Timespan: The final episodes of Season 1 take place during the same few days as The Force Awakens, with "The Core Problem" starting the day before Poe's mission to Jakku. "The Disappeared" lasts from morning to the next morning, leading straight into "Descent". "No Escape, Part I" and "Part II" take place the same day as "Descent" or the next day. FaceHeel Turn: Tam is manipulated by Agent Tierny into believing that the Resistance is evil and so are Kaz and Yeager, who have been using her and Neeku solely to advance their own goals without any genuine regard for their well-being. When Tierny gives her an offer to join the First Order as a pilot, she takes it up in the Season 1 finale. The Faceless: Captain Doza's droids, which makes their presence feel unnerving, cold, and intimidating. Failure Is the Only Option: The crew will never get the Fireball in a condition where it won't literally crash and burn, no matter how much they try. Or so they say. Finally subverted when it actually manages to hold together long enough for an entire battle in "Bibo", likely due to the handiwork of the Resistance mechanics in the previous episode, "Station Theta-Black". As for Tam, she'll never achieve her dream to become a racer. Famed In-Story: Marcus, Yeager's younger brother, is such a famous professional racer that Kaz and Tam visibly freak when they meet him. They're also shocked that Yeager and Marcus even know each other, let alone that they're related. Foolish Sibling, Responsible Sibling: Jarek Yeager and Marcus "Speedstar" Yeager. Marcus is a glory-hound out for fame and fortune who also ended up getting involved in gang activity and organized crime. Meanwhile, Jarek would rather stay out of racing and stick to a quieter life as a mechanic and shop owner. Zigzagged. Resistance eventually catches up to The Force Awakens (and therefore The Last Jedi), that point of time being the Season 1 finale. But other than that, The Rise of Skywalker will come out during Season 2, so viewers have no idea how post-The Last Jedi content in Resistance will go, similar to how Clone Wars led up to the release of Revenge of the Sith. Obviously, the Colossus isn't going to make it to D'Qar when it takes off in that direction in "No Escape, Part II". At the end, Neeku tells Kaz and Yeager that he ran out of time to input the entire coordinates, and descriptions of the Season 2 premiere indicate that the Colossus drops out of hyperspace 3 parsecs from the planet, and has to stop for repairs due to the Artificial Gravity failing. Tam's lack of concern about the First Order in earlier episodes like "The High Tower" is an early hint at her eventual path by the end of the season. In several early episodes, lights are visible in the ocean that seem to just be reflections from the station... but are actually coming from the submerged sections of the Colossus. Getting Crap Past the Radar: While the show is aimed at a younger audience than Rebels and The Clone Wars, this is still Star Wars, so naturally, there's still some risqué content. Especially since the main setting is essentially a pitstop. Posters of pin-ups can be seen hanging around, such as in Rucklin's hangar. On the literal sense of "crap", Neeku more-or-less implies that eating his pet gave him diarrhea before Kaz interrupts him. While sneaking around in Doza Tower at night to spy on Captain Doza and Major Vonreg's meeting, Kaz stumbles into Torra's room while fleeing from stormtroopers. Torra mistakes him for being into her and wanting to do "something" with her, but she turns him down. She then warns him that her father will be furious if he finds him with her and then she tells him to sneak out through her window. Even if they were to have a relationship, Torra is below the age of consent (or barely passes it) in numerous countries, since she's 15 and Kazuda is 20. No word how that works in this galaxy, but Kaz is clearly uncomfortable when she implies it. Aunt Z's Tavern is a recurring location, and the protagonists often go there for drinks. While no one's been seen drunk yet, the patrons are rowdy and Kaz is seen nursing a glass after he screws up with Yeager. Greater-Scope Villain: While Phasma is The Heavy, Snoke and Kylo Ren will be acting behind the scenes. The first we hear of Kylo Ren, he attacked a village on Tehar and killed off a prominent family as revealed in "The Children from Tehar", and Captain Phasma was under orders to capture the surviving children. Hero with Bad Publicity: Kazuda's clumsiness and naivete towards how things work on the Colossus earn him a reputation of being a complete numnoid. At least it means he's the last person anybody would suspect of being a spy. If It Swims, It Flies: The Colossus is not just an oceanic depot that can sink beneath the water. It's a hyperspace-capable mobile space station. Infraction Distraction: Part of why Kaz being a spy works. Nobody would suspect a dummy like Kaz to be able to perform espionage and perform it well. Intelligent Gerbil: The Chelidae are pretty much intelligent turtles. Interquel: It's set after the founding of the Resistance in Bloodline, but before the Sequel Trilogy, but will cross over with it later. In the End, You Are on Your Own: Towards the end of Season 1, the First Order takes over the Colossus during the events of The Force Awakens, meaning that the people of the Colossus have to save the station themselves without help from the Resistance. Knight of Cerebus: General Hux when he gives his speech preceding the destruction of Hosnian Prime, and with the same chilling effect as he did in The Force Awakens (especially considering it's the same audio of Domhnall Gleeson's menacing performance). Late-Arrival Spoiler: Season 2 promotional material, starting with the official poster, doesn't make any effort to hide the Colossus' status as a Space Station and its departure from Castilon or Tam's FaceHeel Turn. Lead You Can Relate To: A young space-Asian boy who wants to be an Ace Pilot, a young space-Latina girl who is an Ace Pilot, a feisty black girl who also wants to be an Ace Pilot, a Space Jews alien dude, and their boss is an older black man who is a war veteran. Leave No Witnesses: The First Order doesn't want the New Republic to know about its violations of the various treaties, its expansion in the Unknown Regions and the various atrocities it has committed. So in one episode, Commander Pyre is dispatched to the Colossus to eliminate the two remaining witnesses to the First Order's operations on Tehar. Lighter and Softer: At least at the beginning, compared to both of the previous shows or any of the new movies, with the possible exception of Solo. Justified, since unlike The Clone Wars and Rebels, which were both set during periods of galactic civil war, Resistance begins in a period of relative peacetime shortly before the Cold War between the Resistance the First Order fully ignites into open conflict. By the end of season 1, however, this no longer applies. Limited Wardrobe: Poe is the only character who wears more than one change of clothes on a regular basis, and he's only a recurring character. Loads and Loads of Characters: By the end of the first season, the show had introduced at least 26 important characters original to it, including both mains and recurrers, as well as four movie characters in important roles and the huge horde of Recurring Extras who populate the Colossus. Luke Nounverber: Parodied. After finding out that Marcus' real last name is Yeager and Speedstar is simply a stage name he took up, Yeager asks Neeku if he thought "Speedstar" was an actual name. The Man Behind the Man: Much like they have done in other stories, the First Order is using proxy forces to get what it wants, in this case Kragan's pirate gang. Meaningful Name: Kaz's ship, the Fireball, according to Yeager and Neeku. Yeager: It's called the Fireball because it has this habit of bursting into flames. The Mole: Synara San, one of the high-ranking members of Kragan's pirate gang, ends up working undercover as a dock worker so that she can assess the Colossus' defenses. A piece of Kazuda's ship comes off while he's flying it, much like Poe's ski-speeder in the climax of The Last Jedi. One of the droids on the Colossus appears to be based on the T3 droid model or may possibly be a successor in that line. We also saw a similar droid under Jaxxon's ownership in Adventures. Torra's ship has design elements of the classic A-Wing interceptor and the older R-41 Starchaser from the X-Wing games. Poe: Looks like the fun's over. The music playing in the background of Aunt Z's during "The Platform Classic" is the same song playing in Jayvar's Cantina. Never My Fault: Rucklin blames Kaz for destroying his racer. However, Rucklin was the one who stole and then used unstable hyperfuel in his racer, which is what lead to its destruction. Averted as soon as the first episode, when Kazuda panics after Vonreg shoots his ship. However, in "The Children from Tehar", after he thinks that the kids are dead, Commander Pyre simply tells Phasma that they are "no more". 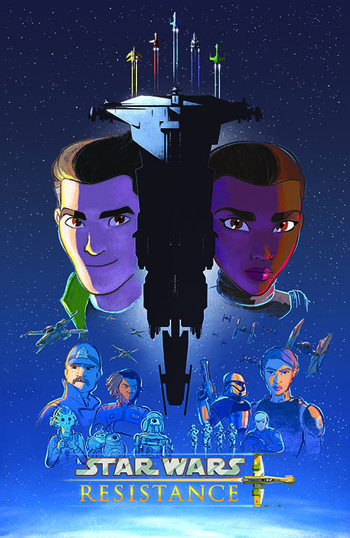 Never Trust a Trailer: Downplayed, but the first trailer for the show made at least the first season out to be purely a lighthearted Denser and Wackier slapstick comedy with bits of action, while in reality, Resistance (although dealing with less heavy subject matter than the previous two shows) isn't much different in tone from an early episode of Rebels or The Clone Wars. Subverted in the first episode. Kaz asks for the refresher, but it's an excuse to cut the scene from Poe telling Kaz to stay where he is to Kaz disobeying Poe's order to look around. In "The Triple Dark", Neeku mentions that after he ate his pet, he got an extreme case of something before Kaz cuts him off. Old School Dogfight: Before the series premiered, Dave Filoni stated that air/space battles would be central to the series, and indeed there are plenty of them featured. Yeager is a former Rebel Alliance and New Republic veteran of the Galactic Civil War. One of the Aces, Griff Halloran, is a former TIE pilot for the Empire who also fought in the Galactic Civil War. We find out in "Secrets and Holograms" that Captain Doza is a former Imperial Navy officer. Overt Operative: Kaz is technically supposed to be undercover on the Colossus. He is still using his real name. The idea that anybody could simply look up background information on him doesn't dawn on Kaz until Captain Doza does it. Perpetual Poverty: Early on, a recurring problem for Kaz is that he's constantly broke since the repair shop doesn't get a lot of customers and Yeager pays him based on how much good work he's done (which is not very much). This leads to Kaz trying to seek out easier ways to make more money or get to a better situation, but he ends up not going through with these for one reason or another. Since Kaz is from a privileged background, this is part of his Character Development into becoming an independent hard worker who can hold financial stability. By the middle of Season 1, he's become capable enough to carry his own weight, and it's implied Marcus gave the shop part of his prize money at the end of "The Platform Classic". Properly Paranoid: Captain Doza is this a lot of times. For example, he is sure there is more to Kaz than him simply being a new mechanic and wanna-be racer; he just doesn't know the details yet. He also tells Yeager not to tell anyone that his crew is repairing the targeting computer for the Colossus' defense cannons because he is a afraid that if they do the information would make its way back to the pirates rather quickly. He proves to be very much right about that assumption. Ramming Always Works: After Kaz realigns the targeting computer him and Yeager are trying to install while being attacked by pirates, it's still not far enough into its dock and he can't get it to go in. Yeager's forklift accidentally ramming the computer gets it to go in. Kaz doesn't change his name when Poe assigns him to spy on the Colossus. So guess what? Captain Doza is eventually able to find out that he used to be a pilot for the New Republic Navy. Unlike in The Clone Wars and Rebels, most of the cast are not fighters. Combined with the Colossus's ban on blasters unless you have a permit (like Yeager), this means most of the characters have to flee and hide when they get into a violent encounter. At the very least, Yeager is a retired veteran soldier, Tam knows some self-defense, and Kaz had military training (although his klutziness and lack of experience often keeps him from effectively engaging in direct physical combat). The primary setting being a barren, plain-looking planet. Kazuda looking out at Castilon's twin moons in the night sky and later the sunset in the series premiere, just like Luke looking out at Tatooine's twin suns at sunset and Ezra looking out at Lothal's twin moons at night. Red Baron: Major Vonreg, an ace First Order TIE Interceptor pilot and recurring antagonist. For added comparison, his armour and ship are also coloured red. BB-8 sticks with Kaz to keep an eye on him at Poe's request while CB-23 stays with Poe. Towards the end of Season 1, BB-8 and CB-23 switch places in time for The Force Awakens. Each Ace has their own unique astromech droid co-pilot, with paint schemes that match their fighters. Sea Monster: Several different species live in the waters of Castilon, most notably the gigantic rokkna. Torra's racer looks like it is based off of the Ford GT40 and/or the Porsche 917 . The Fireball's design is a cross between the Original Trilogy's X-Wing and the Chance-Vought F4U Corsair from World War II. A very deliberate choice by the creators, who wanted Team Fireball to be the underdogs flying an old bucket of a "propeller plane" against the sleek modern "jet-fighters" of the Aces. Torra's name is a reference to Tora! Tora! Tora!, a biographical film about Japan's attack on Pearl Harbor during World War II. The film's name is based on the alleged Japanese radio codeword used to report that the surprise attack on Pearl Harbor was a success, itself a portmanteau of the Japanese words "totsugeki raigeki", or "lightning attack". Jarek Yeager is almost certainly a reference to legendary pilot Chuck Yeager, the first man to break the sound barrier. Single-Biome Planet: Castilon, the Outer Rim ocean planet where the Colossus is located. At least for the first season, anyway. Space Pirates: Kragan's Warbird pirate gang. They were hired by the First Order to perform regular attacks on the Colossus to pressure Captain Doza into inviting the FO onboard as security. Once they've served their purpose, the First Order backstabs them. Space Station: The Colossus' true nature, although before the Season 1 finale it hasn't been in space for at least 20 years. Spectator Casualty: Yeager's wife and daughter were killed while watching a race. Synchronous Episodes: After "The Core Problem", the last several episodes of Season 1 take place during The Force Awakens. At one point, Kaz and Torra secretly watch a First Order meeting broadcasting General Hux's speech at Starkiller Base before the destruction of the Hosnian system. The Teaser: Every episode has one. Kaz asks Neeku what the odds are of a pirate attack while the Aces are away on a mission and the targeting computer for the defense guns are down. Naturally this is when Kragan's pirates arrive. While investigating an abandoned First Order mining facility, Station Theta-Black, Kaz is constantly worried the First Order is going to show up and that they will get lost in the huge facility. Poe responds by telling Kaz that he worries too much. Right after he says this, BB-8 rolls up to inform them that the First Order has arrived. The reason the First Order are going after the last survivors of Tehar. They don't want them to reveal to the rest of the galaxy what the First Order is doing in the Unknown Regions. Kragan's Warbird gang is subjected to this after the First Order is done with them. Those Two Guys: The titular store owners of Flix and Orka's Office of Acquisitions. Thrown Out the Airlock: In the season 2 premiere, how Kaz and Torra deal with a stowaway First Order BB unit. Title-Only Opening: Episodes open, as in Rebels, with the show's title and logo after a teaser. "Buggle's Day Out", starring Torra's pet Voorpak, Buggles. The preview clip for "No Escape, Part I" is, like all of them, titled after a line of dialogue in the clip, specifically Agent Tierny saying "I Beg to Differ"... but on its YouTube listing, it's "I Bet to Differ". Wham Episode: Both halves of "No Escape". The Colossus is actually a mobile space station, and Kaz and company eventually launch it into space to escape the First Order. Tam, meanwhile, is persuaded by Agent Tierny to betray her friends and join the First Order, and Kaz and Yeager aren't able to stop her. Kaz watches his homeworld get blown up on a live hologram transmission. The repercussions of these events are still unknown. "Secrets and Holograms": Captain Doza's closet has an Imperial Navy officer's uniform in it. After helping Kaz escape some scuba troopers, Neeku is excitedly wondering what else can be controlled from the control room he, Eila and Kel are in. Eila wordlessly points up at the ceiling, where Neeku and Kel look to see... a hyperdrive. We get a combo with Wham Line as we see a broadcast of the speech General Hux gives in The Force Awakens just before Starkiller Base fires on the Hosnian system.